DeviDoll loves to support a wide range of ethical businesses that we feel share our passion for great quality, world-class design and sound ethics to boot. So we were hotly anticipating the annual Observer Ethical Awards 2009, hosted last night in London, and feel proud to annouce the full list of winners here. We know that you also love to support companies, individuals and organisations that strive to do good stuff for the environment and society, while providing services and products that don't compromise on style or quality. 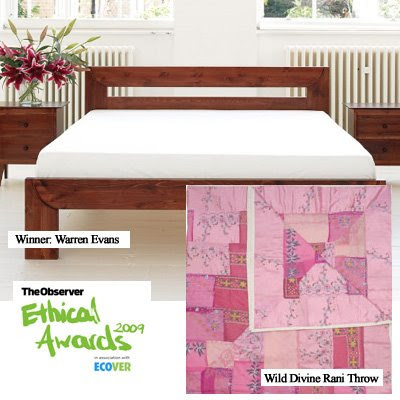 Amongst last night's winners we think you'll especially love veggie box scheme Riverford Organics and Warren Evans, which makes the most gorgeous ethical bedroom furniture and luxury beds - the perfect complement to our Wild Divine Rani Throw, made from vintage fabric, a steal at £80, reduced from £170. Warren Evans, the leading ethical bed and bedroom furniture business.